French Cassettes from left: Ben Isganitis on drums, Scott Huerta sings and plays lead guitars, Thomas Huerta plays bass, and Mackenzie Bunch on guitar and keys. French Cassettes, based out of San Francisco and Fresno, played a show at Submission in San Francisco's Mission district, Sunday, Jan. 29. Photo by Melissa Burman. It is largely through trial and error that the French Cassettes have become the band they are today. The indie pop quartet, consisting of Scott Huerta on lead vocals and guitar, his brother Thomas Huerta on bass, Mackenzie Bunch on guitar and keys, and Ben Isganites on drums, originally came together while attending high school in Ripon, Calif. For five years now, they have been bringing life to small stages with their catchy songs and vibrant performances. After making their mark in the Central Valley through local shows and a number of casual EP releases, the French Cassettes began to shift towards the Bay Area, beginning with Scott’s acceptance to SF State. Though Scott loved San Francisco, he found he had little desire to pursue anything outside of his own musical endeavors. He dropped out after a semester, but not without forming some important friendships. Bunch, the band’s guitarist, would later join Scott in San Francisco, to pursue urban studies and planning at SF State. Currently, the two bandmates live in the city with seven roommates, while the bassist, Thomas, and drummer, Isganitis, still reside in the Central Valley. In their five years as the French Cassettes, they’ve tried to sound like other bands, experimented with different instruments, and seen members come and go, but the four current members have become a solid unit, and have found success in a new approach to their songwriting: not trying so hard. 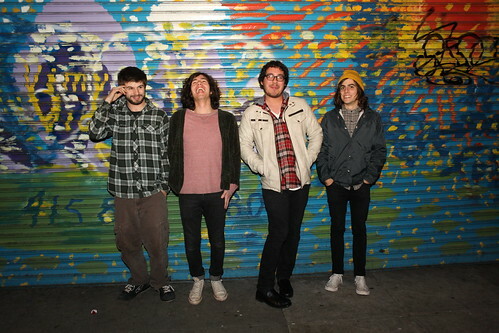 “Summer Darling,” their latest EP, was released in the summer of 2011. It has been one of the most significant accomplishments to the band, namely because of a track called “Radley,” which has an accompanying music video, directed by the Perez Brothers. “We never actually met the actors, the mermaid and everyone, and since we’re not big, a lot of people actually think those kids are us,” he added with a laugh. Not only is “Radley” the band’s first official video, but the song also represents a turning point in their music. The band strives to write music that provokes movement and ultimately sticks with listeners. They have made an impression on friends and first-time listeners alike. “Their hard work pays off and people can see that [in their stage presence],” said Paula Duarte, a senior BECA major at SF State and roommate of Scott and Bunch. With 10 songs ready to record, a full-length album could be what’s on the horizon. The band will be looking to funding site IndieGoGo to get started. The French Cassettes will be back in San Francisco to perform at the Rickshaw Stop March 4. For music and upcoming tour dates, visit the French Cassettes Facebook page.